NEW INDIA ASSURANCE CO. LTD, founded by Sir Dorabji Tata in 1919, a Multinational General Insurance Company, today operates in 28 countries and headquartered at Mumbai, India. Our global business crossed Rs. 26,554 crores in March 2018. We have been market leaders in India in Non – Life business for more than 40 years. Our Indian business crossed Rs.22,952 crores in March 2018. 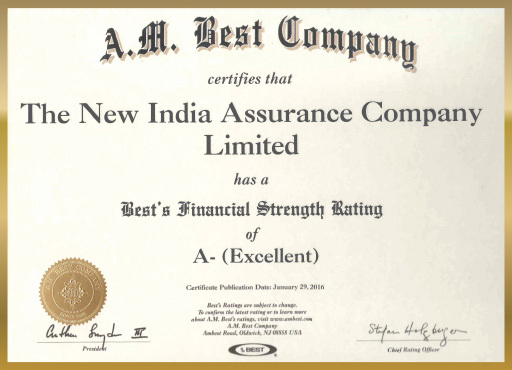 We are the only direct insurer in India rated A-(Excellent) by AM BEST Company since 2007. We have been rated AAA/Stable by CRISIL since 2014, indicating that the Company has the highest degree of Financial Strength to honor its Policyholder’s obligations. Largest number of offices - India and abroad. 19,000 trained and technically qualified staff. 2200 fully computerised offices across India. First domestic company to be rated by an International Rating Agency. Rating based up on following factors:- Superior capital strength, Strong operating performance, Dominant market position. Only company to develop significant International operating, long record of successful trading outside India. Overseas operation commenced in 1920. Operation in 28 countries. Network of 9 Branches, 7 Agencies, and 3 Subsidiary companies. Overseas Premium of USD 465 million in the year 2014-15, which accounts for more than 17.71% of total premium in India. "A-(Excellent-Stable)" rating by A.M. BEST CRISIL RATING "AM (Stable Otlook)"
©2017 The New India Assurance Co. Ltd. All rights reserved.